This is part 1 of my 5-part travel series on Ubud where I share things to note as a foreigner living in Ubud and how to make the best out of your trip here. Contrary to what some may think, I came to Ubud on a personal and work retreat. Not for business meetings, but to do my private work. Singapore was killing me with the endless droves of people, the stressed-up climate, and the in-your-face consumerism. Noise pollution is also a serious issue with loud construction everywhere. The city architecture is also beginning to feel claustrophobic. Within a few weeks here, I was able to quickly reconnect with my spirit, become super productive, and get a lot done. Creating articles and podcasts happens readily in Ubud since I can get in the flow — the boundless nature and serenity make it easy. Being in Ubud gives me the space to think and let my consciousness expand — which I realize is essential in my work of creating high consciousness content for you. Bonus: Lots of nature and greenery. Then I thought of Ubud. I’ve heard good things about it before but never explored the place. After researching, I realized that it’s the perfect spot. And indeed it is! Update in 2018: After revisiting Ubud, I find that it’s starting to get more commercialized. It is still a great place for veganism, rest, and healing though, especially if you stay in the countryside. I share more of my thoughts in the conclusion in part 5. Ubud is a quiet town rich in nature and is a mecca for healthy food, veganism, yoga, arts, and spirituality. It is known for being the cultural hub of Bali and has dense forests, small farms, and rice paddies in the area. With a population of about 34,000 people, there is absolutely no issue of space here. Ubud shouldn’t be confused with the more touristy parts of Bali which are Kuta, Legian (famous for its beach), and Seminyak (famous for shopping, bars, cafes). 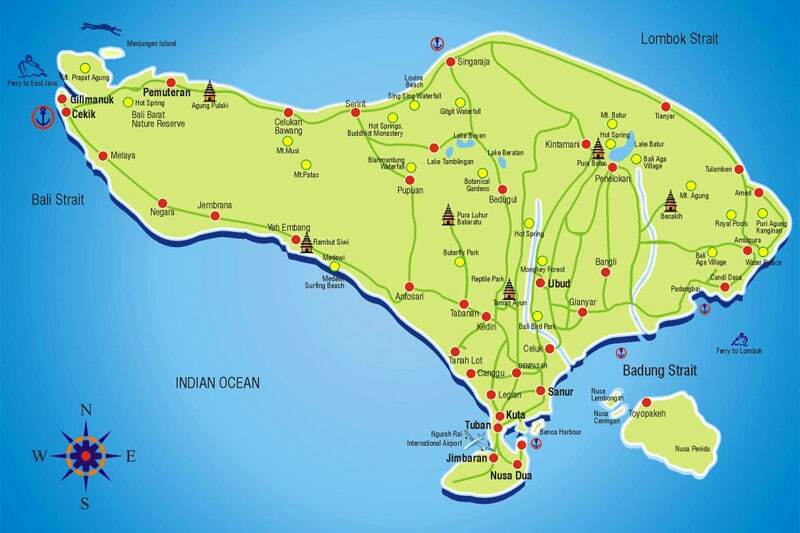 These areas are south of Ubud. While some people may like these places, I have been there before and am honestly not a fan. My husband and I were there during our honeymoon in 2014, and we had three separate encounters of being conned in our few days in Seminyak — ranging from a taxi driver who silently smiled and pocketed the excess cash when we gave him the wrong amount, to a K-mart store clerk who intentionally quoted a false total for our purchases (which we caught in time). After researching online, I found out that tourist conning is a norm in Kuta/Seminyak, even with money changers. Search “Bali money changer cheat” on Google and you’ll know what I mean. A local in Ubud told me that this conning practice is common in Kuta/Seminyak because many people working in those areas are not local Balinese but folks from other regions. They are just there to earn money and brought with them several bad practices, such as tourist conning. That’s a shame as it really does associate a bad rep with Bali. Don’t get me wrong: I’m sure Kuta/Seminyak is great with nice shops, nice cafes, and honest people. The hotel we stayed at (Ossotel) had great staff for example. I’m just not a fan of staying at a place where I need to constantly be on guard against scams, dishonest people, and what not. In Ubud, people are more down to earth though there are still dodgy people (I find this more so in 2018). This also depends on where you live — if you live in Ubud Center (considered the central hub of Ubud, though it’s really the foreigners that come here and not the locals), you’ll meet a lot of people trying to solicit for services, trying to earn money from you, trying to profiteer. By profiteer, I mean trying to earn an excessive or the highest amount of cash from you without necessarily focusing on the value or being fair. This is particularly so for taxi/transport drivers. Given that I’m not local, whenever I try to book a transport ride, the drivers quote very high and unreasonable rates, after which I need to haggle (more on transport in part 3). When I was buying a prepaid SIM card in Ubud Center, the clerk initially quoted me price X but suddenly changed and told me to pay a higher price after she installed the card in my phone. The profiteering spirit is much worse in Kuta/Seminyak, but I have noticed some element of it in Ubud especially in 2018. If you live in the countryside, I think you’ll meet more down-to-earth people, though these folks wouldn’t know English so you can’t speak with them anyway. There will be the occasional folks who run commercialized tourist operations (cooking classes, accommodation, transport services) in the countryside who will try to profiteer from you though because they feel you should pay the high rates. There is basically a “me vs. you” mentality in the local community: if you are a foreigner (and it’ll be obvious based on your looks), they will treat you differently and see you as a source of income, rather than a fellow human whom they try to help out. No visa required — Applies to the majority of countries including Singapore. Free entry, valid for 30 days, NOT extendable. Visa on arrival — You pay and get this upon arrival at the Indonesia airport. Costs USD 35, valid for 30 days, extendable once for 30 days. Visa needed — You need to apply for this at your local (or overseas) embassy before going to Indonesia. Hidden Option — 60-Day Tourist Visa. Apparently, you can apply for a 60-day tourist visa. You need to apply this at your local (or overseas) embassy before going to Indonesia. This is more troublesome than Options 1 and 2 but gives you the option to stay in Bali for as long as 6 months as you can extend the visa four times (for 30 days each) when you are in Bali. More information below. Your passport must be valid for at least 6 months from the date of arrival. The day of arrival counts as one day while the day of departure counts as another day. If you’re going in with no visa (Option 1), your trip isn’t eligible for an extension. You can only stay for 30 days and then get out. To stay longer, you need to deliberately apply for a Visa on Arrival (Option 2) despite not needing a visa, after which you need to apply for a visa extension (of 30 days) while inside Bali. Or you can apply for a 60-day Tourist Visa at your local (or overseas) embassy before entering Indonesia. If you’re going for Visa on Arrival (Option 2), you are eligible for a one-time extension of 30 days. Read this page and this page on how to do so. Note that you should extend your visa at least seven days prior to its expiry. Don’t wait until the last minute as the Indonesian embassy isn’t known for its speediness! If you’re going for a 60-day Tourist Visa (Option 4), you are eligible for four separate visa extensions of 30 days each. This is the best option if you want to get the longest stay in Bali without leaving. Read this page on how to do so. I couldn’t find any official rule about how long you must be out of Indonesia before you can return. If you are a daredevil, you can do a visa run — get a plane ticket to a neighboring country (Singapore is the most popular destination), then return to Indonesia on a same-day flight. But they are starting to clamp down on this in Singapore. There have been stories of people getting sent back to Indonesia for such visa runs, though these stories are still few and far between. Just know that if you try something like this, there’s a risk of being caught as it’s obvious what your plan is. Since I’m on a Singapore passport, I fall under Option 1 and don’t need a visa. I decided to make the best out of my trip each time and stayed for close to a month. 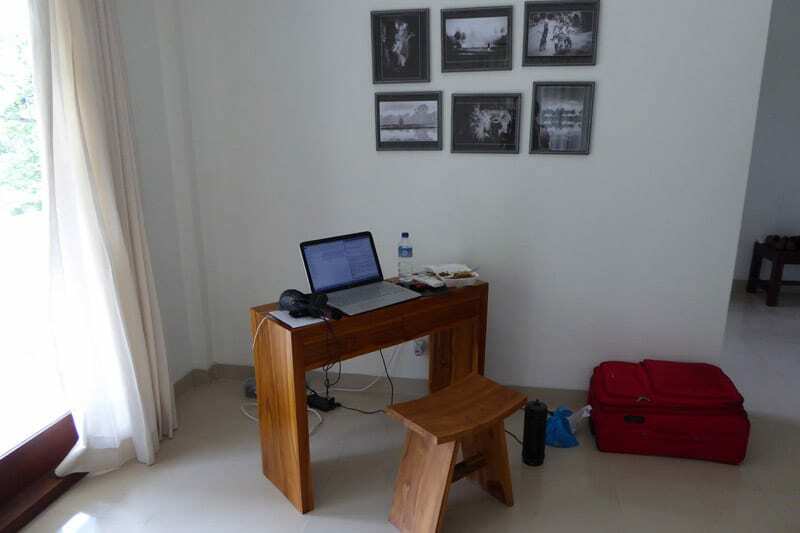 Since I went to Ubud to get alone time to work, the quality of my accommodation was crucial. So I spent the most time researching where to stay. I searched HostelWorld.com and realized that they only let guests book for a maximum of 14 days for whatever reason. And booking a hostel, even if I were to get a private room, would mean constantly hearing footsteps along the corridor, dealing with a high turnover of guests, and hearing people talk loudly at night. Having stayed in many hostels in my 20s, I wasn’t keen on that. Hotel is definitely out — staying for a month at a hotel would be way too expensive. I thought of Airbnb. After a quick search, I realized that there is a healthy selection of places at good prices! 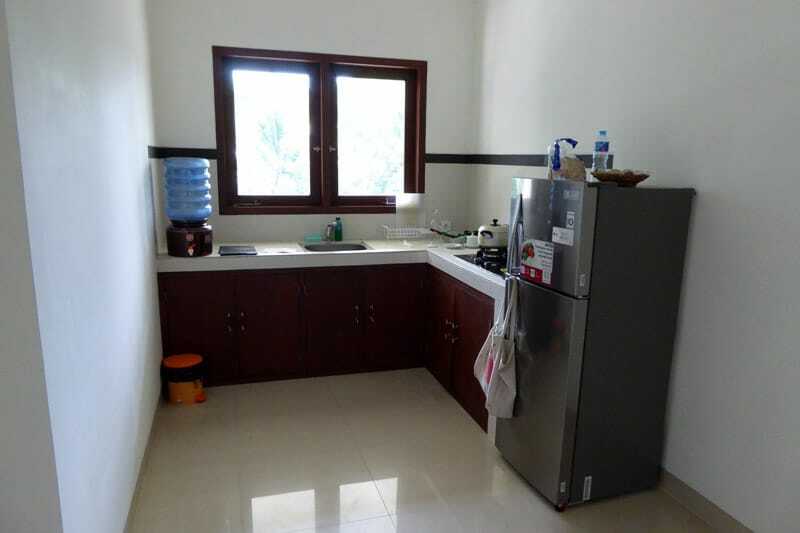 For example, you can get a whole villa unit to yourself, complete with a balcony, a living-room-combined-with-bedroom, a kitchen, and a private bathroom from USD 550/month (including 10% Airbnb charges; rates from 2016). Including utilities, aircon, and cleaning fee. Crazy, huh??? The downside is that it would be located in the Ubud countryside, a few kilometers away from Ubud Center (where all the vegan restaurants and activities are). In Singapore, you can at best rent a tiny bedroom at an off-center location with that price and have to pay a separate utility charge. Plus there will likely be other catches like noisy road, nearby construction, noisy neighbors, and the like. 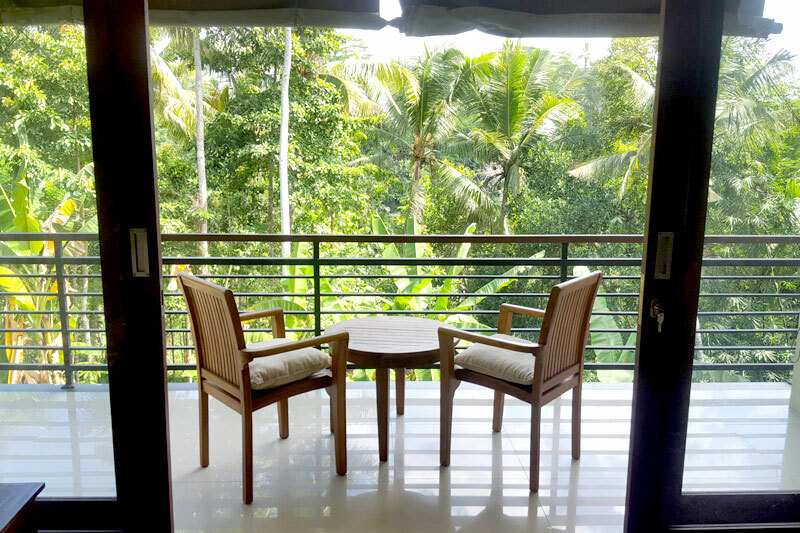 After exchanging messages with some Airbnb homeowners, I decided to book a one-month accommodation in the countryside, at a home about 6km away from Ubud Center. Here are the pictures! The ground floor where the owner stays. I stayed on the 2nd floor. Work desk. I would have preferred a bigger desk for podcasting but this was enough to get my writing done. Kitchen. I ended up doing a fair bit of cooking in my later weeks because it’s difficult to get out when you can’t ride a scooter. 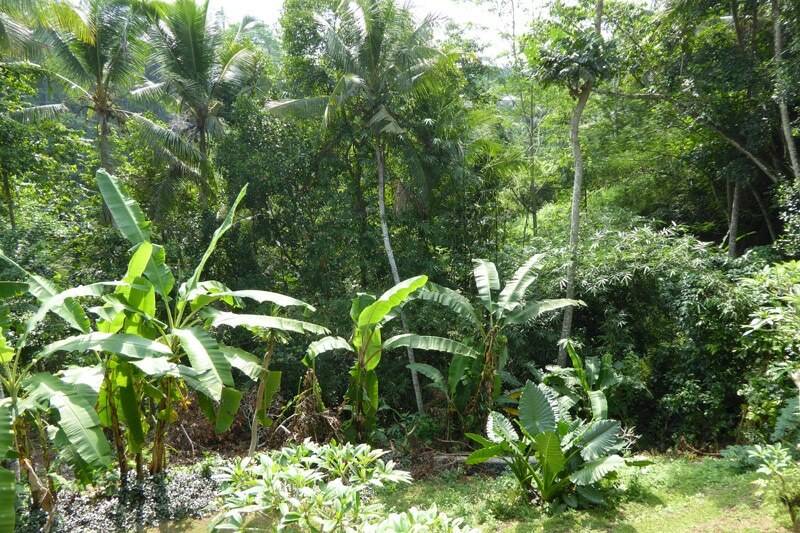 I was living in the countryside, about 6km away from Ubud Center. For those of you new to Airbnb, it’s a website to find good lodging without break-neck hotel prices. Registration is free and you only pay when you book. With 4 million listings in 191 countries (as of 2017), you’ll definitely be able to find something no matter where you’re going! I used Airbnb when I was at New York City for two months in 2011, and it’s thanks to Airbnb that Ken and I could secure last-minute accommodation when we went to Edinburgh for our pre-wedding photoshoot. Whether you are looking for a low-budget option or a high-end suite at good prices, Airbnb has that. In fact, Airbnb is giving hotels a run for their money. If you don’t have an Airbnb account, register under my link here (aff) and you will immediately get a USD 30 free credit that you can use for your next booking. This offer is only valid while Airbnb is offering it, so register for your account first to lock in your free USD 30 credit lest they stop or change the referral bonus next time. There is no expiry and you can use the credit any time you travel. For my 2018 visit, I booked a place in Ubud Center because I wanted to be right where all the vegan restaurants are. During my 2016 stay in the countryside, I felt annoyed by the difficulty in getting to Ubud Center after a while and felt that I was held “hostage” by my homeowner and private drivers who would charge heightened rates for transport into town. If I was staying for a few days it wouldn’t be an issue, but since I was staying for a month the costs became quite unreasonable. Living far away wouldn’t be a problem if I could ride the scooter, but I can’t. For my 2018 place (booked through Airbnb again), it was a simple one-bedroom unit, an attached bathroom, a balcony, a work desk, and a chair. It was simple and served my needs. After some negotiation and because it was the low-peak season, I was able to get 238k rupiah (USD 16) per night for 16 nights (and paid an extra 11+% for Airbnb fees). 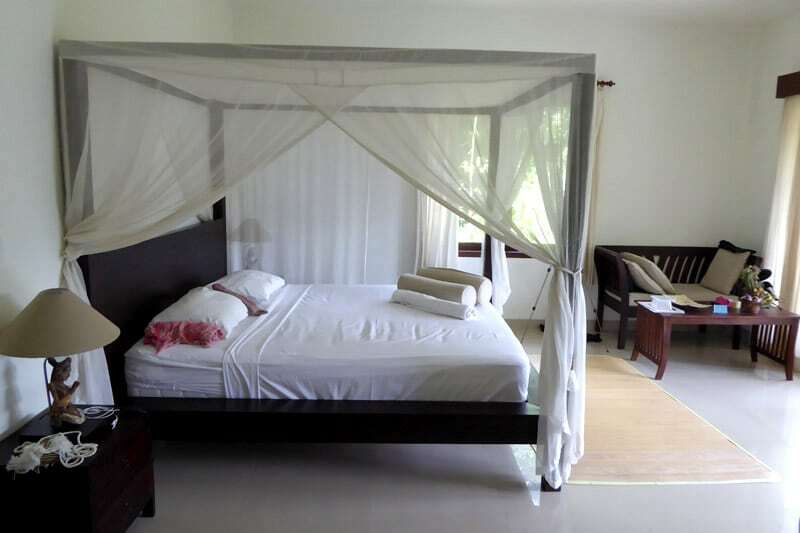 I subsequently extended for another 8 nights at 200k rupiah (USD 14) per night. Because I liaised with the owner directly for my extension, I avoided paying the extra Airbnb fees. Overall, I’d say that there are pros and cons to staying in Ubud Center vs. the countryside. In the countryside, you are in a world of your own. Great nature, serenity, quiet. However, it’s difficult to get to Ubud Center unless you ride the scooter. 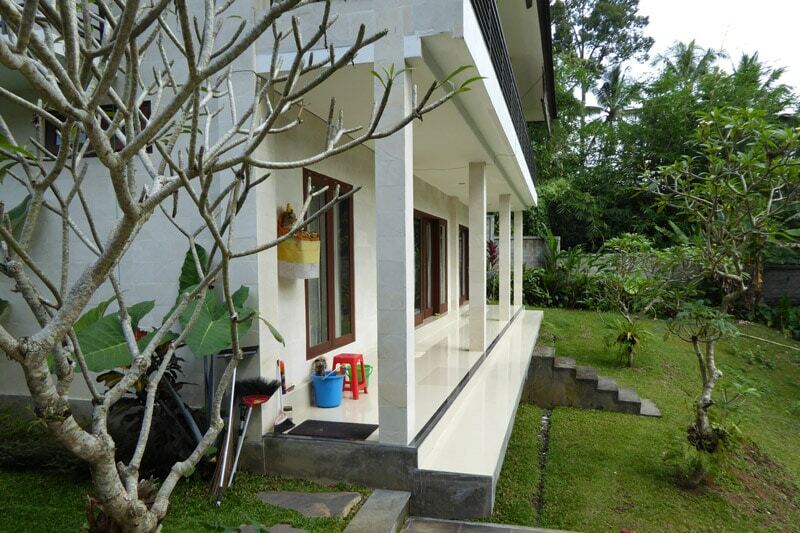 My accommodation in Ubud Center is great too, a lot of nature sounds, scenery, and limited traffic noises. However, it was irritating to get around after a while as you would be constantly solicited with services every 30 seconds (“Taxi? Massage?”), and the air pollution is terrible with vehicle fumes and people smoking. The air quality was fine at my accommodation in Ubud Center; it was only the streets that were a problem. Ubud Center is basically a commercial center targeted at tourists — locals don’t come here unless they run some business here. The best scenario is to stay in the countryside and rent a scooter to wherever you need. If you can’t ride a scooter, get a quiet lodging very near the places/restaurants you want to frequent, so you can minimize walking and breathing in bad air. Or bring a mask so you can wear it while walking around the town area. Besides lodging, I also booked airport pickup. Most Ubud Airbnb hosts offer airport pickup for a fee. This is helpful since homes here are hard to find and there is no official or reliable transport. The standard rate that Ubud Airbnb hosts will quote for a one-way ride is 350k rupiah or USD 26. (This is the same in 2016 and 2018.) 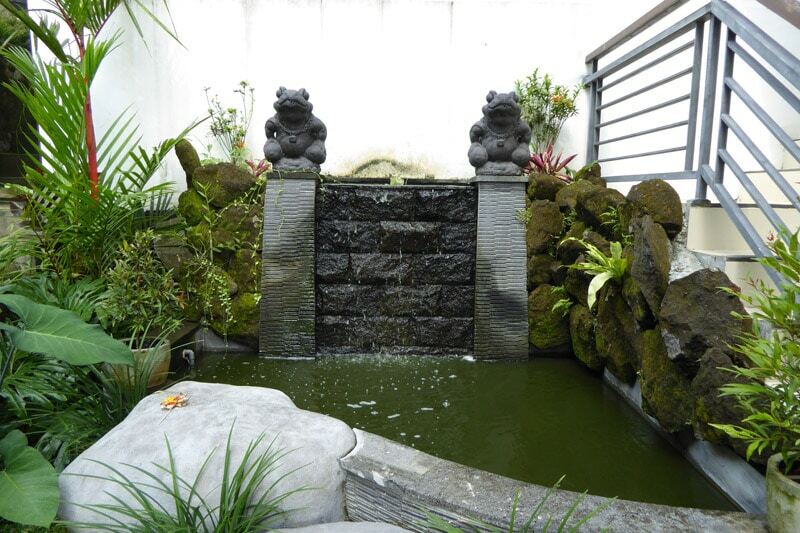 Some greedy homeowners may try to quote you 400k rupiah — reject them. The “official” rate if you book airport transport in Ubud Center (after you reach Ubud) is actually 300k rupiah from Ubud to the airport. Before booking your place, ask your host for the price for a one-way airport transfer first. Then, negotiate the price for a two-way transport. You really shouldn’t pay more than 300k rupiah per ride because this is the standard rate, but hey, I also recognize that you are likely at the mercy of their quoted fees. By negotiating for a two-way transport first, I managed to get the price down to this rate (600k rupiah or USD 45 for a two-way transfer) for my 2018 trip. By booking transport with the host, you know that this person is verified with Airbnb. Booking direct transport got me safely to my accommodation each time after a 1hr 15-30 min ride. Similarly, booking direct transport for my return flight meant not having to worry about getting transport on the day of departure and focusing on packing. If you prefer to get a cab from the airport, you should be able to negotiate a 300k rupiah fee (or less) from the airport to Ubud. The ride is about 1-2 hours depending on traffic. If you’re going to Kuta/Seminyak, the rate should be much cheaper as Ubud is further away from the airport. This is part 1 of my 5-part travel series on Ubud where I share things to note as a traveler living in Ubud and how to make the best out of your trip here.